For me, a lot of why I like interviews is learning how people deal with handling the day to day obstacles that come with doing things on their own. I surpassed whatever my parents could offer me as advice at 20 or so, and not graduating from college, I don’t have a network of brothers/classmates that I can tap for professional and life advice. I learn from the people I meet and their experiences, be it life or business. John Seymour has successfully managed to balance being a father to three daughters, husband, and restauranteur through trials and tribulations. 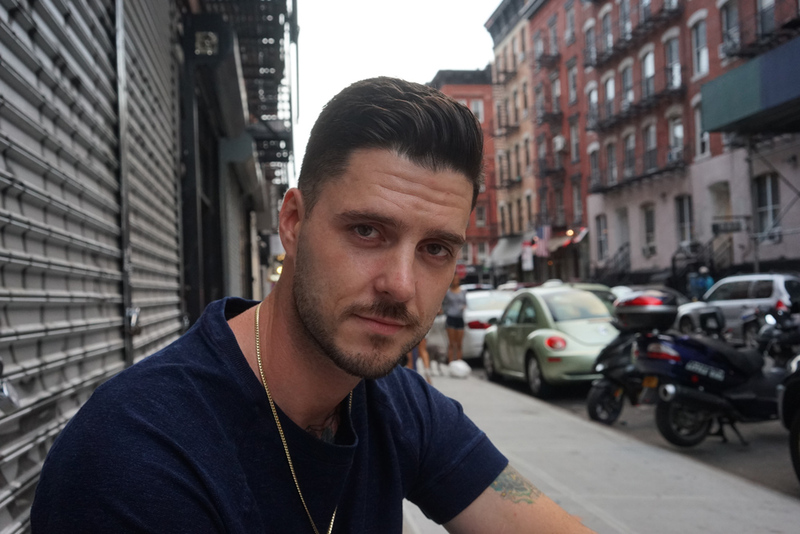 From humble beginnings as a doorman in his teens, to bouts with addiction, John’s managed to navigate obstacle after obstacle. 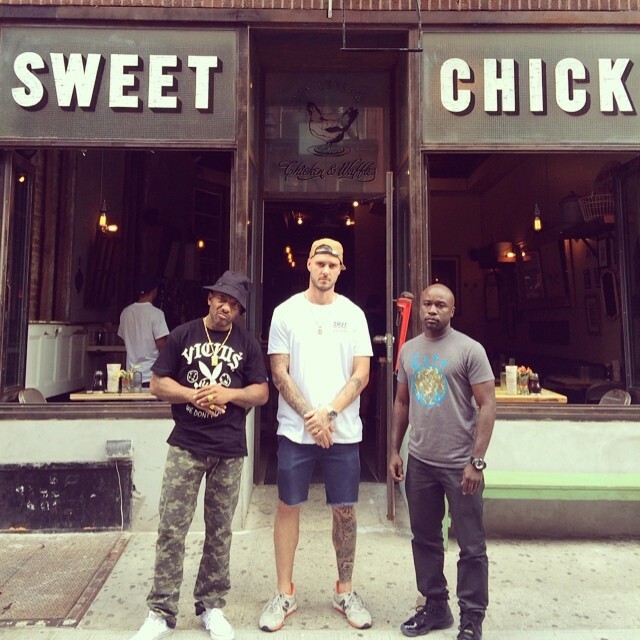 Now the owner of three restaurants Pop’s and Sweet Chick (Brooklyn and Lower East Side), his mantra is a lyric taken from his favorite Biggie song “Juicy”: “‘Cause I went from negative to positive… And it’s still all good!” With that mentality, he’s manage to turn his burger and fried chicken joints into neighborhood staples for patrons far and wide. Read on to learn how he got to where he is today and more below. PETE PABON: How did you get into the restaurant business? JOHN SEYMOUR: I grew up around bars – my father was a bartender – so customer service came really naturally. I originally made my lunch money by serving beers as a young kid. Eventually I ended up working in restaurants as a busser, waiter, and then became a bartender myself. So I’ve been in the industry for a long time. About seven years ago, my wife and I opened up a small burger spot in Brooklyn called Pop’s and that took off right away. 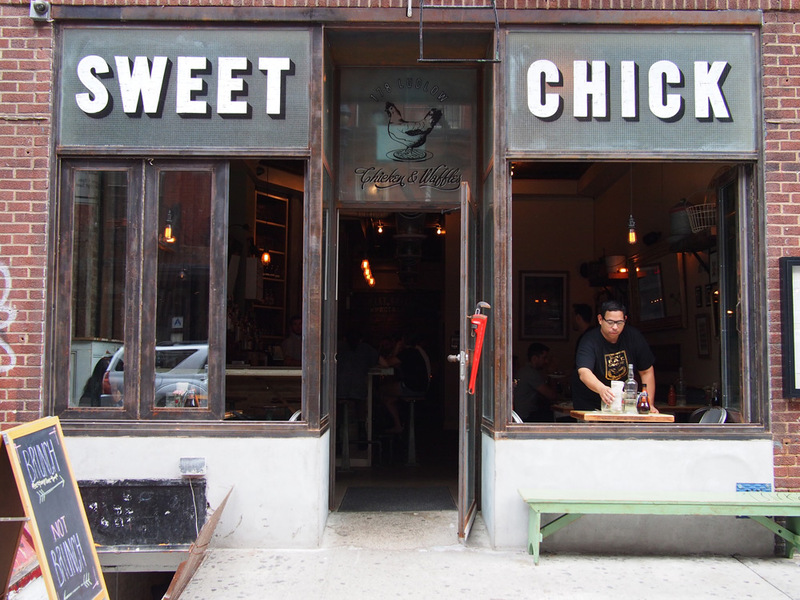 A year and a half ago we got into Sweet Chick in Brooklyn, and here we are in Williamsburg. How was it getting over that initial hump at Pop’s? Because restaurant businesses are really, really hard. Yeah. With Pop’s it didn’t seem like much of a hump. We were there all the time and the only thing that got easier was we were able to step away and not spend as much time in there. There were days my wife was cooking burgers in the back and I’d be at the register. But from day one, the business started making money and people responded really well to it. Obviously over time it got better and better. But we were pretty lucky in that respect, I think we were putting out a good product and at the time the neighborhood really needed it too. Right at that time [when we opened Pop’s] the whole economic crisis happened. So we were serving something that was affordable – it’s all grass feed beef and everything – and had quality ingredients. You can go into Pop’s and get a burger for five bucks. At the time, I think it was perfect timing for us and perfect timing for the neighborhood. With Mobb Deep. From John’s Instagram @thisguyjohnseymour. You also had a situation where you were in AA or went through rehab. How does that affect you in your current situation here? So the story behind – where it all starts – is my father was an alcoholic. But he was sober for my whole life and he was a bartender. So growing up, he always told us that we were allergic to alcohol, me and my brother. I always thought that I would break out in hives or something like that. So early on I always knew that. And as I got older, I had problems with alcohol and drugs and I got sober at 24 years old. Pretty much after getting sober I started bartending. Which is crazy. I did a stint as an electrician and then I became a bartender. How do you separate that? But at the end of the day, my wife drinks like a normal person and plenty of people drink like normal people and they can enjoy it. So I have no problem serving it in the restaurants. I have a full liquor license at my restaurants, it’s really been no problem for me. Except for [the fact] that I can’t get to try all these fancy cocktails that we make. 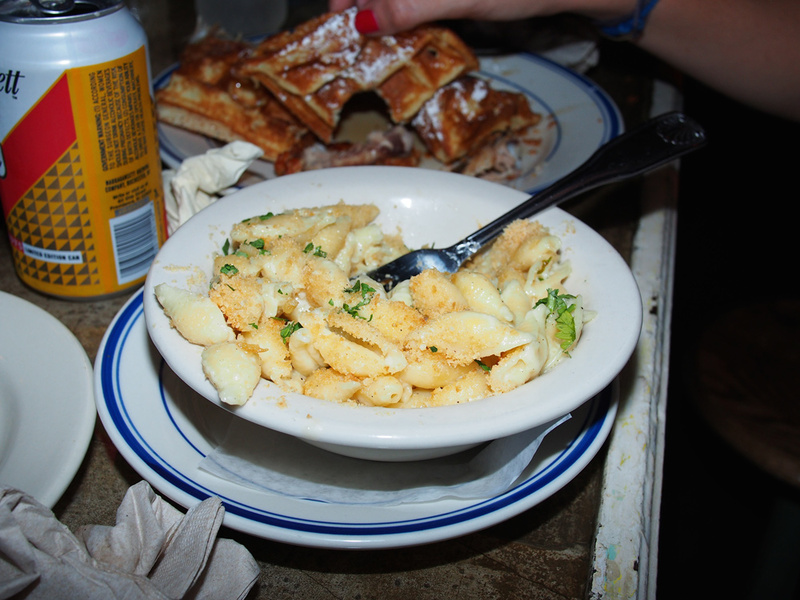 Mac and Cheese from Sweet Chick. Now you have Sweet Chick Brooklyn, Pop’s, and now Sweet Chick in the Lower Eastside – on top of being a devoted husband and family man. How do you manage all these responsibilities? So managing all the restaurants and being a dad – three kids, three restaurants, a wife – it’s very difficult and I’m learning on a daily basis how to handle it. The normal routine is wake up, help my wife with the kids, make my wife coffee – that’s very important. Get the kids fed, if it’s winter time and they go to school I’ll usually drop them at school, try to fit in the gym at some stage, and then go about the day. By 6 o’clock I’m already thinking, “Oh, I gotta head home soon.” Because bath time is right around 7. Dinner and bath time are around 6:30 or 7 and the kids go to bed at 8. We have a pretty serious schedule for these kids, they go to bed at 8 o’clock every night so I’m usually home for that every night. Yeah, just being social and being around. It’s like having another kid and I don’t want to neglect any of my kids so it’s a difficult balancing act. Some days you sacrifice one for the other and it’s still a learning process. I know there was a lot of controversy in taking over the old Max Fish spot, how were you able to navigate that successfully and keep the mystique that is 178 Ludlow? So I originally saw the “For Rent” sign at the Pink Pony, which is next door to Max Fish and when I realized I didn’t have a liquor license, the guy told me, “Well, Max Fish just closed and they’re selling their liquor license.” So I looked inside and thought it was pretty big shoes to fill – as anybody else would. Being from New York City, I have a lot of respect for New York City history and culture that most out-of-towners don’t even understand. I was definitely not a Max Fish regular in my drinking days. I had been through here and had a drink. I was a little apprehensive, but I thought to myself, “I’m from New York City and if I don’t take it, the next person to look at it might be the owner of Starbucks.” I figured that at least I might be able to try and preserve some of the character there. I’ve met Ulli [Rimkus], the owner of Max Fish, a few times now and I can’t wait to have her over for chicken and waffles. But I’ve had a good response, some of the old heads from Max Fish have been in. I just went to the pre-opening last night – the new Max Fish. I think I’ve preserved some of the character. The General. Fried chicken doused in General Tso’s sauce with rice + broccoli waffles. I saw you kept the outline of the bar. The outline, the footprint is there. I actually reused a lot of the old materials from the old Max Fish. One specific thing was all the doorframes for the entrance of Max Fish. I used that as Wayne’s coating and moldings and stuff around the restaurant. It was definitely a special place in a lot of our hearts. Yeah, and I know that. To me it’s another New York City landmark that’s gone by way of rising rents. That seems to be the case in the Lower East Side. Yeah, and it’s the same case in Williamsburg with Pop’s. My first place that I opened seven years ago, in another three years, the landlord is going to knock down those buildings and they don’t care. Pop’s has been somewhat of a institution in Williamsburg, so I’m going to have to find another location to put it somewhere. It’s the grind of doing business in New York City. Yeah, there’s no more long term—there are no spots that have been there for 20 years. Unless you own the building. Katz’s Deli, they own their building. But unless you own the building, there’s no security. If you have a ten-year lease, you have a ten-year lease. 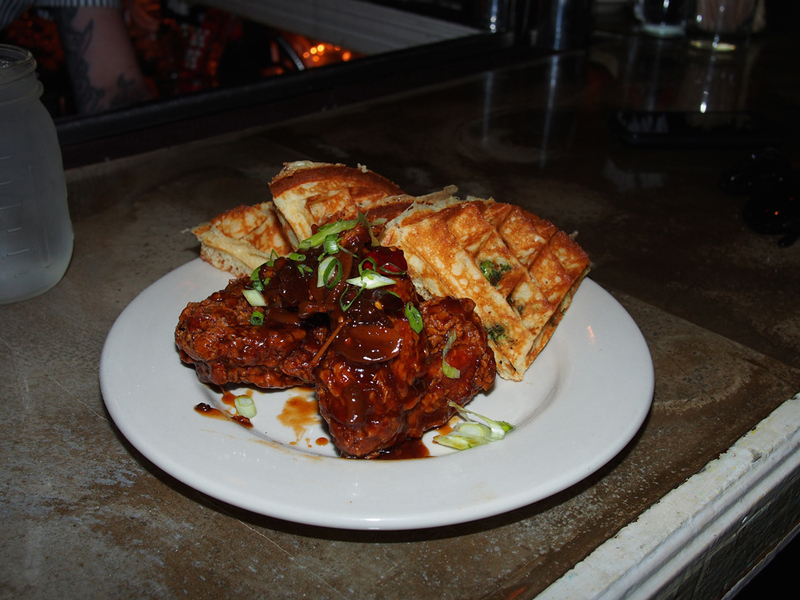 Can give some insight on why you chose soul food – chicken and waffles – as the backbone of Sweet Chick? So choosing chicken and waffles to be the backbone of Sweet Chick. We just decided that. Originally it started in New York City in Harlem with the jazz musicians, late night. A couple of places had been doing it for a long time but no one really dedicated to it and nobody’s really taking it to the next level and doing it really well. For us, we’re making our waffle batter every hour, we’re brining our chicken, we spent months trying to make the right dish. 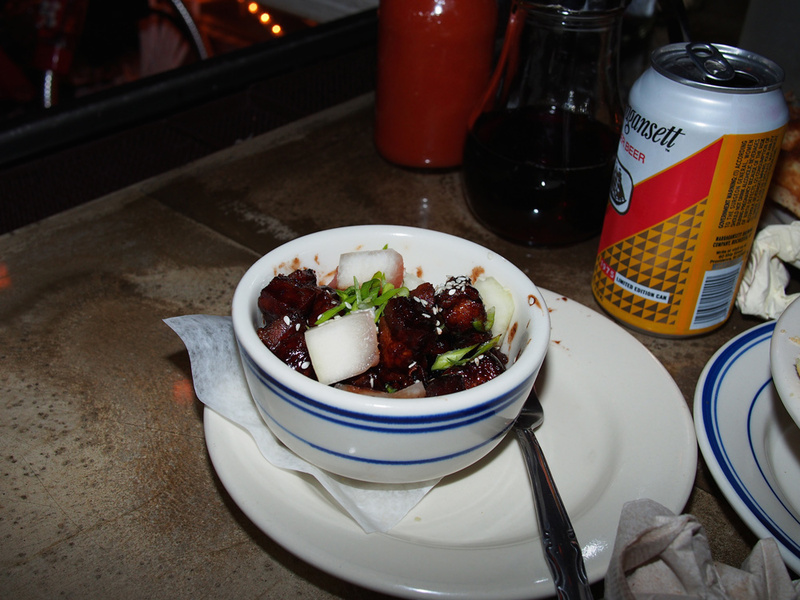 It also lends itself to a good time, and so at Sweet Chick people tell us, walking out the door, how much fun they had. So it’s kind of an all-around win for us, to surround ourselves with that dish. It seems like a social food. It’s not too pretentious, it’s not too laid back, it’s approachable, and you can eat it any time of day. What’s the soundtrack at Sweet Chick? And what are your favorite songs you guys have been playing lately? A lot of our approach to customer service – Biggie has had a big impact on it. Our mantra for our staff is, “We went from negative to positive and it’s all good.” I had an issue with a customer one night and that’s basically what happened, and the people left and they were super happy. So if you ask our staff what the mantra is, they would say, “We went from negative to positive and it’s all good.” Because there’s never a problem we can’t fix. Things are going to happen, people are going to spill stuff on themselves, anything can happen. It’s a restaurant in New York City. There’s always an opportunity for us to take that, turn it around, and have them leave with a good feeling. So “Juicy” – it’s also the story of a come up. Which kind of reflects my own life too. That’s definitely the song I love to hear now. As far as anything new—what’s that Shmurda dance guy, what’s his name? Bobby Shmurda, that’s the new song right now. Really? It’s hard man, my radio is busted in my car, I have a ’96 Acura Integra. Bobby Shmurda gets it turnt up late night. [laughs] But we like to just play what’s fun and if people are going to vibe on it, then we’re going to play it. Obviously if we like it we’re going to play it. Any final words or thank yous? Thanks to The Hundreds for having me here, and Pete Pabon, brother. 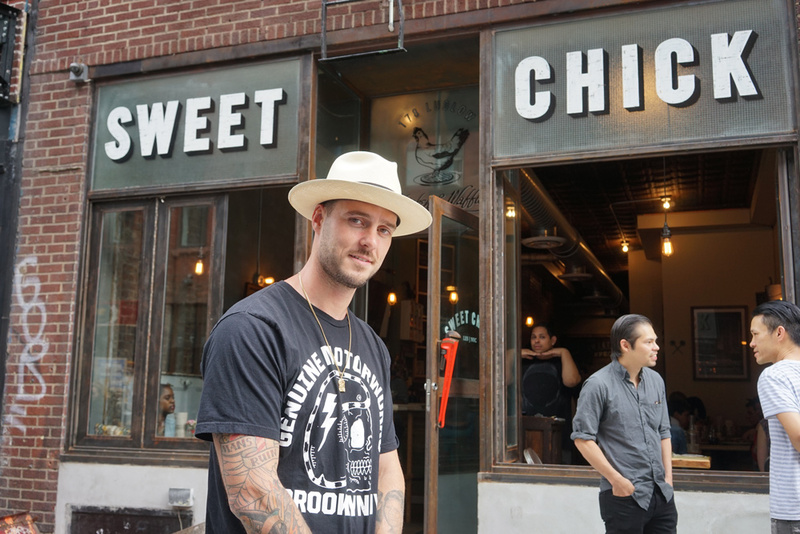 Follow John Seymour on Instagram at @thisguyjohnseymour and visit SweetChickNYC.com for more information on visiting during your next stop in New York. You can find more info about Pop’s here.